10 seeds sent with growing notes. A hardy and useful shrub, related to the lilly pilly, producing edible fruit. Great as a hedge or screen, with dense branches of evergreen glossy dark green leaves with copper coloured tips turning bright red in cold weather. Trees begin to bear fruit between 2 and 4 years. Three weeks after fragrant pollen rich flowers appear the ribbed green fruit develop, turning a bright deep red when ripe. The main fruiting season is summer but smaller crops occur throughout the year. The skin is very thin, the flesh is melting and juicy, with a touch of acid. Although enjoyable fresh from the plant, the flavour is quite resinous and tart if not completely ripe (wait until they fall off the tree with a light touch) and leave in the fridge a few hours to enhance sweetness. The fruit is high in Vitamin C. They are an excellent addition to fruit cups, salads and custard pudding; also ice cream; and can be made into pie or sauce or preserved whole in syrup. They are often made into jam, jelly, relish or pickles. Brazilians ferment the juice into vinegar or wine, and sometimes prepare a distilled liquor. The aromatic foliage can be crushed and used as an effective fly repellent. The seeds should not be eaten. Diarrhea has occurred in dogs that have been fed the whole fruits by children. Medicinal Uses: In Brazil the leaf infusion is taken as a stomachic, febrifuge and astringent. In Surinam, the leaf decoction is drunk as a cold remedy and, in combination with lemongrass, as a febrifuge. The leaves yield essential oil containing citronellal, geranyl acetate, geraniol, cineole, terpinene, sesquiterpenes and polyterpenes. Note: in northern NSW the plant has escaped gardens as birds spread the seed. Please net your tree or collect all fruit if you live in this area. 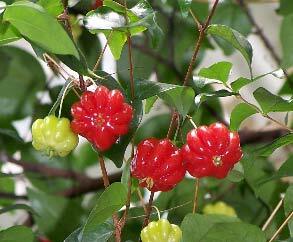 Also known as Surinam Cherry or Pitanga, it is native to South America. Quite frost tolerant. Young plants are damaged by temperatures below -2� C, but well-established plants can survive -5� C. Full sun is best for greatest fruit production. Very adaptable to different soil types: Sand, sandy loam, stiff clay, soft limestone. It can stand waterlogging for a time and also drought. It is intolerant of salt.